1. The Initial Meeting: Bring any information you have, including drawings, sketches, brochures, pictures, or magazine articles you may have assembled. Having a “must have” wish list for your home is also helpful at this meeting. If you already own property, bring the site address and any possible information you have on your property including a survey and elevation certificate. We will review all aspects of your new home and establish your budget. We will refer you to a financing entity if you do not already have one. Tundra Homes is a technology oriented company. Using the internet, all of your documents, including drawings, contracts, specifications, etc., can be sent to you in PDF or other applicable electronic formats for your on-line review. This creates a maximum level of interaction with a minimum level of inconvenience to you. 2. After the meeting, preliminary plans are started. 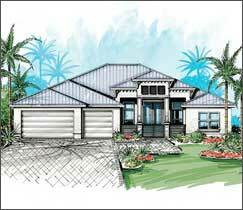 • If you are building a custom home: After the general budget with allowance amounts is established, you will then meet with the designer to start preliminary plans & place a deposit with the designer. Upon our entering a contract, the deposit is deducted from the cost of your home if we are including the cost of your plans in our contract. During this stage we work closely with the designer to make sure your home design offers the latest in innovation & energy efficiency, fits your needs and desires, and can be built within your established budget. • If you are building one of our floor plans: No deposit will be required until we provide you finalized pricing & you are ready to sign the contract. Increase the allowance amount in the contract and have the extra cost rolled into the loan amount. 3. The design phase begins: During this phase, your home design is refined and completed. Meet with any other vendor or subcontractor requiring coordination. 4. Final Pricing and Contract Execution: At this phase your drawings are complete, your colors, cabinets, appliances, and flooring are selected, your final pricing is completed, and your financing is in place. We are now ready to execute your contract and proceed to permitting your new home. 5. Building Department & Governmental Agency Permitting: The permitting package for your new home is submitted to the building department and any other governmental agency required for construction permitting. • Pre-foundation or home location: Typically you only need to be involved in this phase if issues exist such as; tree preservation, unusual site conditions, etc. If you are an out-of-town owner, usually these items can be handled without your presence at the jobsite. • Pre-Drywall inspection: You may want to be present at the jobsite for this phase. When the mechanical, electrical, and plumbing rough-in's are completed, we schedule a jobsite meeting and together we thoroughly inspect the home prior to the drywall being installed. Specific items we will be inspecting include not only general overall conformance to the plans and design, but specifically the plumbing, electrical, HVAC, and technology installations to allow for easy modifications you may desire before drywall is installed. • Completion Walk-through Inspection: At the conclusion of construction and before you move in, we schedule a jobsite meeting and conduct a walk-through. During this meeting, we run through a checklist and inspect your entire home room by room and ensure your home is move-in ready. At the conclusion of this inspection, we confirm your move-in date, finalize any financial transactions and completion documents, then any punch-list items generated from the walk-thru are coordinated with the subs to be completed prior to your move-in date. 7. Closing/Move-In: Your home is finished, all last minute items are complete, the local building department has issued the certificate of occupancy, your homeowners insurance policy is in place and the lender has made their final inspection and disbursement. Closing papers are signed and you are now ready to move in. Congratulations on your new home!